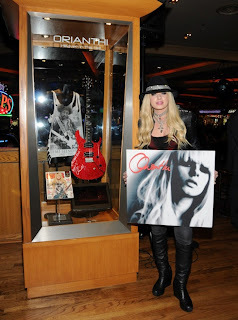 Hollywood, CA - On Thursday, April 25th, just prior to her show in the hotel's rock venue Vinyl, the Hard Rock Hotel & Casino in Las Vegas unveiled a displaying honoring the work of platinum selling solo artist and Australian guitarist Orianthi. 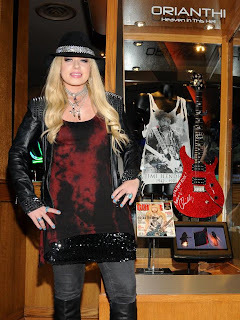 Several hours later, Orianthi along with Glen Sobel (drummer for Alice Cooper) and Vivi Rama (bassist for Macy Gray, Jordin Sparks) performed to a packed house at Vinyl. Prior to her show a crowd filled with fans, Hard Rock Hotel executives and media gathered for the unveiling ceremony of a glass display case, designed by Warwick Stone, honoring the young guitarist's work. Paul Davis, VP of Entertainment for the Hard Rock Hotel kicked off the ceremony by discussing Orianthi's accomplishments as a guitarist and solo artist. 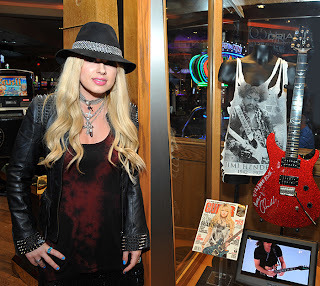 Max McAndrew, Booking and Operations Manager of Vinyl, followed with a brief interview with Orianthi about working with Michael Jackson, touring with Alice Cooper and her latest album Heaven In This Hell, produced by Dave Stewart (of the Eurythmics). A beaming Orianthi commented this was "a very surreal moment" before she and Paul together pulled the black cover to unveil the display which includes her signature Scarlet Red PRS model guitar, the April 2013 Guitar World issue with Orianthi on the cover, the Jimi Hendrix tee she wore for the cover shoot, along with a video (on continuous loop) of her performing. For an indefinite period, the display will live in a high-traffic area of the main casino near the entrance to The Joint and Club Vinyl. Following LA-based rockers Future Villains, Orianthi took the stage for a 80-minute show. Fans were treated to a set list that included tracks off her latest album Heaven In This Hell, as well as a few of her previous hits. "If You Think You Know Me"